Completa. 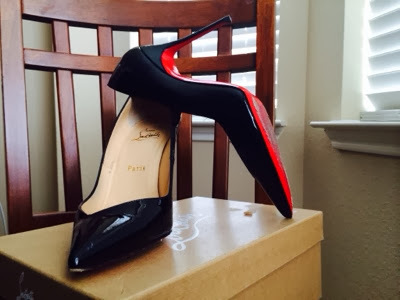 That's the feeling you get when you own your first pair of Christian Louboutin's. It was my birthday, Monday October 7th and I had been hinting about some CL's for a while. I was getting dressed to head to my birthday dinner/event and while I was in my closet looking for something, I remember throwing a clothing garment over what looked like a wrapped gift box but I was moving so fast that I thought to myself "no, can't be" and kept it moving. 3 days later I was lost in my closet again; this time I was organizing. 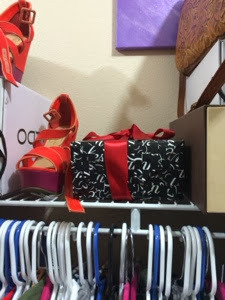 I find an unwrapped black and white Saks 5th Avenue box with a pretty red bow sitting pretty on the top shelf my closet still underneath that piece of clothing I had thrown over it a couple of days before. I couldn't understand why he hadn't told me that my shoes/birthday present was in my closet this whole time. He really wanted to surprise me and he did. Love you honey. Needless to say, they are beautiful! They hurt my feet just like all Louboutin's but they are totally worth it.